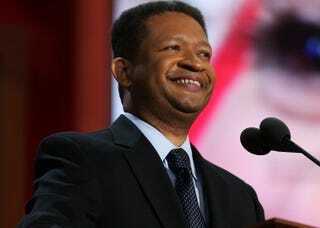 (The Root) — You can't blame Republicans for inviting Artur Davis to their convention. They'd like to embarrass President Barack Obama. And as gags go, they could do a lot worse than bringing in Davis — the very same guy who seconded Obama's nomination at the Democrats' convention in Denver four years ago — and handing him a headlining speaking slot at theirs. Thanking the cheering crowd for "welcoming me where I belong," Davis said he spoke for more than "six million of us who got it wrong in 2008," and voiced his support for Mitt Romney while knocking the president on Obamacare, gas prices and the president's "flowery words" — words he said that once "blinded us a little." Mocking the well-worn themes of the last four years, from "yes, we can" to "moving oceans and healing planets" — a dig at Obama's own speech four years ago in Denver — in ten minutes, Davis completely disowned the president. All he forgot to say was, "my bad." Because in 2008, Davis wasn't just any Obama supporter. Back then — in flowery words of his own — he proclaimed that Obama "will lead and inspire the free world." Right here on The Root, he lauded candidate Obama for proposing "a new social contract on health insurance" — which President Obama delivered — right before Davis ditched him. It was that about-face which led Davis' former House colleagues to describe his party switch as “a nakedly personal and political calculation." But Davis said Democrats no longer speak for him, and charged that Obama broke faith with Democrats past. He heaped praise on LBJ's great society programs — and with no trace of irony, saluted Bill Clinton — the president who tried and failed to deliver healthcare reform. While ignoring that Obamacare took Romneycare national, he said that Obama never adopted "a single Republican idea." Davis even found time to squeeze "Let's take this country back" in. He just never made it quite clear from whom.